Published in 1974, The Forever War is considered one of the greatest pieces of science-fiction literature to have ever existed. 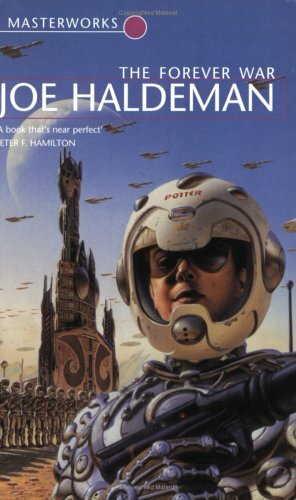 Winner of the Nebula Award in 1975, and the Hugo and Locus awards in 1976, the novel established Joe Haldeman as one of military science fiction’s supreme writers. The book’s narrative – centered on the surreal conflict between mankind and the mysterious Taurans – is strikingly significant now as it was back then. The Forever War’s success prompted a number of sequels, including Forever Free (1999) and Forever Peace (1997). The novel further inspired a novella, A Separate War (1999), alongside a comic book, and a board game. It has the prestige of being the first title in the SF Masterworks series, which is a collection of the world’s greatest science-fiction novels. Beginning in an alternate history, from 1997, the story is told via the first-person perspective of William Mandella, a physics student who is conscripted for an elite task force in the United Nations Exploratory Force. The Tauran, a mysterious alien race, had attacked human colonist ships. The UN, considering this to be an act of war, sends the UNEF out for reconnaissance and revenge. After a grueling training regime – in which many of his fellow recruits die from environmental hazards and live weapons – Mandella and the surviving graduates jet off into space to hunt down the Tauran. Using interconnected space gates (“collapsars”) the UNEF ships are able to travel across the galaxy near-lightspeed. Even so, traveling via these gates causes a relativistic effect: the first expedition began in 1997 and takes two years from the soldiers’ perspective. Yet, upon returning home, the soldiers notice that several decades have passed on Earth due to time dilation. As Mandella is sent on various campaigns, time on Earth rapidly goes by. And whenever he comes back home, he returns to a world that becomes increasingly unfamiliar, and more dangerous by the centuries. It’s widely known that The Forever War is based on Haldeman’s own military service during the Vietnam War. The story uses the lens of space opera to filter his experiences. The odd time dilation angle symbolizes the alienation and culture shock that Vietnam veterans went through upon revisiting their homeland and discovering a completely different America. Ultimately, their efforts and actions were lent to a meaningless war. The novel undermines the typical space opera clichés, including the heroic soldier’s influence on battles through individual actions. Haldeman himself considers these clichés to be silly from the viewpoint of someone who had seen real combat. The story’s accurate depiction of an increasingly violent and immoral world is repeated by today’s society. As Mandella is relieved from duty every now and again, he revisits his home planet to discover vast unemployment, lawless districts, scarce power supplies, corrupt law enforcement, and the wide promotion of homosexuality to curb overpopulation. Pros: The Forever War’s originality and plot development are among its strongest highlights. The chilling interpretation of a bleak future and the alienation it gives to Mandella will keep the pages turning. As for William Mandella himself, he is arguably one of science-fiction’s most memorable protagonists. And without spoiling it, the ending is one of the most well thought conclusions of any work of fiction in existence. Cons: There aren’t any noticeable flaws to the novel, as the science elements are very realistic, with a straightforward plot to boot. If one is to nitpick, beside Mandella and his love interest, Marygay Potter, the other characters do not stand out as much and become forgotten like the nostalgic Earth they stand to protect. The Tauran are not given much focus, too.